Freeze-proof your water system the quick and easy way. 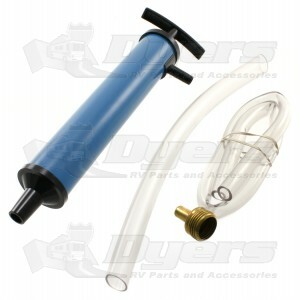 Pump antifreeze directly into your RV waterlines and supply tanks. I bought this pump so I could winterize our travel trailer. When I tried to hook it up to the city water connection, it would not screw on! The treads don't go to the end of the fitting. I had to cut the end off an old hose I had with some hose and put it on the pump with aa hose clamp. Like I said, the pump works well but they need to put a better city water connector on it.